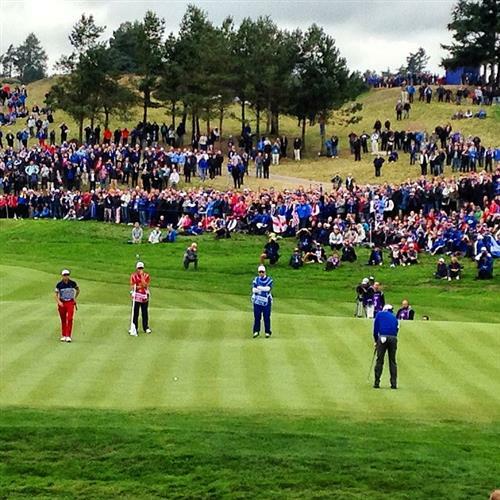 Perfect approach from Poulter. His best shot of the day. Oh stop it Rory! Another fantastic shot. Golf from another planet. No bogeys and two birdies from Gallacher today. Solid golf. What an up and down from Reed. A more muted celebration this time. But Stenson taps in to remain just 1 down. Superb match against Reed. Wow shot of the day from Rose. In fact possibly shot of the tournament. He looks at the camera and says "A bit of Seve for you". Fowler has to win ALL five of the last holes against McIlroy to avoid defeat. Not going to happen. G-Mac had 2 putts to win the hole... and he didn't need them. Great first putt. McIlroy thrashes Fowler. Some of the best golf we've seen all year. 7 birdies and an eagle in the first 12 holes. A sensational second on the 11th from Donaldson sees Bradley concede a birdie three. The American can't repeat the trick and the Welshman goes three up. Mickelson wraps up a 3&1 victory over Gallacher on the 17th and you've got to ask why he wasn't play at all yesterday when the USA imploded in the foursomes. Results storming in as Kaymer sinks a cheeky chip to record a 4&2 success over Watson. Kuchar takes the USA to nine points with his 4&3 demolition of Bjorn and the score now stands at 13-9 in favour of Europe. The only blue on the leaderboard at the moment is next to the name of Donaldson and his four hole lead is a cause for much relief from a European perspective as it should ensure there'll be no nerve shredding climax. Four American victories so far today and three successes in the singles for the Europeans. It's been a creditable fightback from the USA but not quite explosive enough to unnerve the home side. That Donaldson cushion looking even more significant as Johnson goes one up for the first time in the whole match against Dubisson on the 11th. Westwood birdies the 13th and the deficit is cut to two against Walker. Elsewhere, Garcia is back on terms with Furyk after the American misses a relatively straightforward putt. 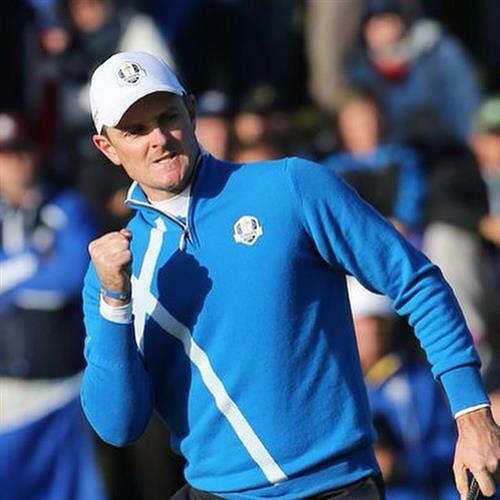 Aaah, sporting immortality beckoned on the 14th for Donaldson, who had a putt to win the Ryder Cup. The Welshman couldn't make it but at four up with four to play, it's now merely a stay of execution from an American perspective. Well done Jamie Donaldson. 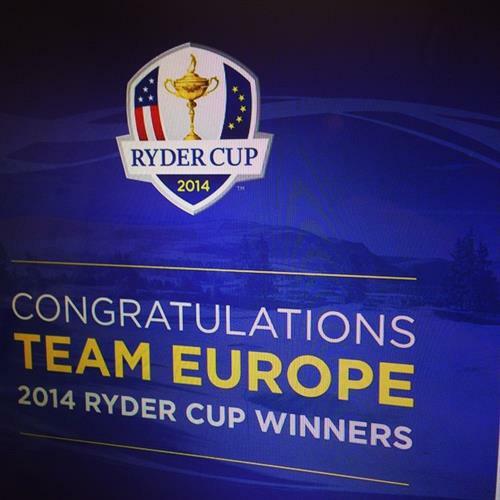 What a great Ryder Cup for him, and Europe generally. A Welshman brings it home for Europe! Awesome performance today by a Jamie Donaldson! Jamie Donaldson you beauty. You wait so long for a Welsh player in the Ryder Cup and then this happens. 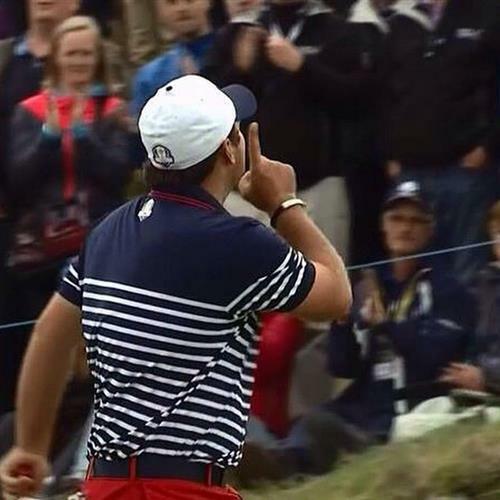 The Ryder Cup is won.